Using landing sound as a feedback mechanism provides a cost-effective, simple way for clinicians, coaches, and athletes to decrease vGRFs (vertical ground reaction forces) and therefore potentially decrease the prevalence of lower-limb injuries. However, I would suggest that this is only a start to the rehab process, there’s much more involved, including a next step after learning how to land with decreased ground reaction forces. 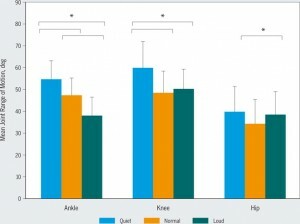 By landing more quietly, the risk of injury does decrease, however, increased knee and ankle excursion (but not hip) increase an athlete’s time on the ground. While this increased time on the ground works for other species, it slows humans down. Therefore, I would suggest that teaching athletes to land softly and quietly should not be the end goal. Soft-landing instruction, which is advocated in several injury prevention programs, is thought to have a qualitative relationship with decreased vertical ground reaction forces (vGRFs) and increased lower-limb joint excursions. To quantify the relationships among landing sound, vGRFs, and lower-limb kinematics during a drop-landing task. Twenty-six asymptomatic men aged 18 to 35 years were asked to perform 15 single-leg drop landings from a 30-cm height. Five trials were collected under 3 sound conditions: normal, quiet, and loud. The vGRF, lower-limb kinematics (sagittal plane), and impact sound were recorded during the deceleration phase. 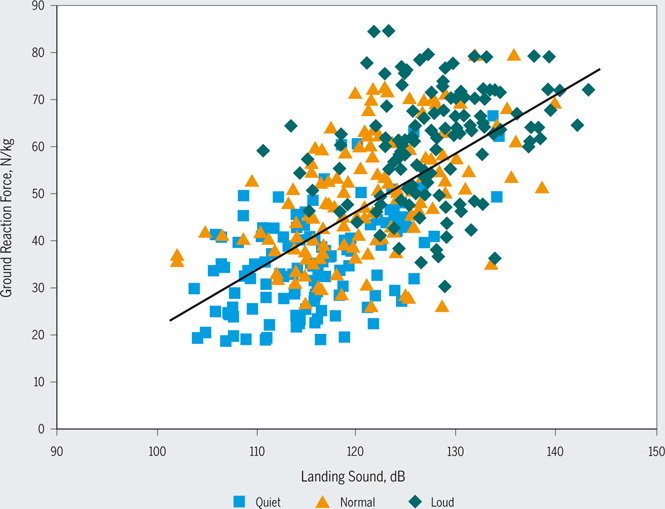 A simple linear regression revealed a significant relationship between landing sound and vGRF (R2 = 0.42, P<.001). A repeated-measures analysis of variance showed that ankle and knee excursion significantly increased by 7.0° and 11.7°, respectively, during quiet landing (compared to normal landing; P<.001). During the loud landing condition, ankle joint excursion significantly decreased by 9.4° compared to the normal landing condition (P<.001), and hip joint excursion significantly increased by 4.0° compared to normal landing condition (P<.045). As landing sound decreases, so does vGRF during a drop-landing task. These reductions were achieved by increasing ankle and knee joint excursions. Conversely, as the landing sound increases, so does vGRF. This was the result of decreasing ankle joint excursion and increasing hip joint excursion.